This stunning Murano glassware set is a vivid interplay of original Murano glass and colorful details. Featuring an understated silhouette combined with an expressive color theme and a touch of 925 silver. 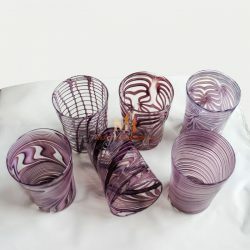 These 6 tumblers are handcrafted using traditional glassblowing techniques from the island Murano, Italy. Kept in a smooth, clean shape. These handmade drinking glasses will brighten any festive table setting and would be a perfect as a gift.